Another “Golden Boy” emerges as a nephew of Oscar De La Hoya will soon turn pro and is expected to make his ring debut in December. The WBC said that Diego De La Hoya who had some 250 fights as an amateur will soon be competing in the pro ranks. Boxing Scene reported that Diego was born on August 13,1994 in Mexicali, Baja California, Mexico and has represented Mexico for over four years in international tournaments. Boxing Scene said Diego, son of Paul De La Hoya, is the first cousin of former champion and Golden Boy Promotions President Oscar De La Hoya. Diego's father (Paul) is the brother of Mr. Joel De La Hoya (father of Oscar), and boxing has been in his blood since he was 6 years old in his native Mexicali. The report said Diego was regarded as a rising star by the boxing talent scouts of the Mexican Olympic Committee in 2009 and was immediately recruited. The young amateur had an apparently great run in amateur boxing competitions held on 5 continents, in a number of countries, including five visits to tournaments in Cuba, where he had many triumphs. There were reportedly two reasons for Diego’s decision to turn pro. 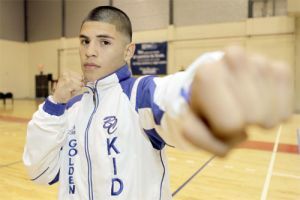 The first was that he could not qualify for 2012 London Olympics after losing to hot Mexican prospect Oscar Valdez. And the second reason was that amateur fighters will now have to compete without head gear. Diego De La Hoya was quoted as saying "If I'm getting in there without head gear, it will be for money and I'm getting paid." His pro boxing career will be handled by father Joel De La Hoya and cousin Joel De La Hoya Jr., who is Oscar's brother and a talent scout.